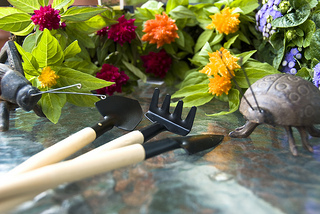 Gardening is a favorite pastime for many Kendal at Home members. Not only is tending a garden a wonderful way to beautify the exterior of your home, according to HCR ManorCare, it has a number of mental and physical benefits for older adults, too. However, gardening can become more difficult with age, especially if you suffer from certain health conditions, specifically those that cause difficulty breathing. The good news is, a few minor modifications to how you approach gardening can remove some of the aches and pains gardening can cause for older adults who often have trouble bending, squatting, pushing, or lifting. Pushing wheelbarrows overflowing with dirt and lugging around heavy hoes, shovels, and hoses is a young man's game. Trading in your heavy go-to tools for lightweight counterparts or making minor modifications to your current tools can make a big difference in your gardening. If you haven't used them in the past, be sure to use gardening gloves to protect your hands and provide extra cushioning on tools. Gloves with leather palms or rose gloves that protect hands from thorns are the best for preventing injury. Just because you've always approached gardening one way, doesn't mean it's the best way for an older adult. Now may be the time to reexamine and redesign your approach to gardening. In years past, your garden may have stretched for miles, seeming like a professionally landscaped exterior pulled straight from a movie. You may not be able to recreate your garden's expansive beauty of yesteryear as you age, but that doesn't mean you can't produce beautiful blooms on a smaller scale!